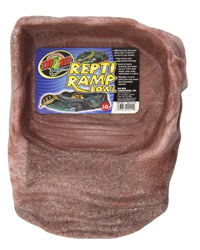 ZooMed Repti Ramp Bowl allows easy in and out access for your animals. Easy access ramp helps prevent drowning. Great for lizards, terrestrial land turtles, frogs, toads, salamanders or snakes. Washable, no micro pitting like resin bowls plus unbreakable material.